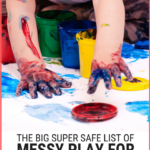 Epic Messy Play List that's Sensory-Filled, Inspiring, and Easy! Get inspired with amazing messy play for your kid or toddler that is totally easy. 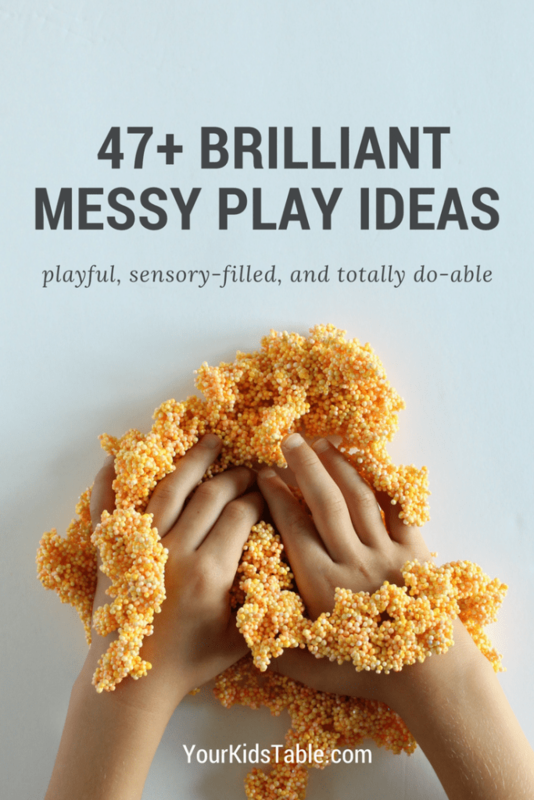 Over 47 messy play ideas with tips to keep clean up simple and why the heck messy play is so important. Sam, that’s my oldest son, was around 16 months old and I can remember thinking, “Is he old enough?” I stood there staring at the finger paints and then at him, wondering if he would be able to actually participate in this messy play activity without just trying to eat the paint the entire time. I was REALLY anxious to try because I’m a pediatric OT (occupational therapist) this was actually a rite of passage, of sorts, for both of us. I decided to go for it. I grabbed a huge roll of paper and taped it to the top of the kitchen island, stripped him down to his diaper, and stood close by ready to bat down any hands that attempted to enter his mouth. Thankfully, he dove right in spreading the wet gooey paint all of he paper and his hands. He was totally engaged and spread it as far as he could reach on the table. I was ecstatic that he was enjoying the messy play, I knew it was good for him on many levels (more on that in a minute). What happened next made my OT heart happy as a clam, but as a Mama I cringed a little… he swiped the paint purposefully across his belly, then around in circles. He was completely lost in this new sensation as he continued to spread the wet paint onto his chest and his arms. It was impossible not to laugh and once I did he looked up at me with a huge smile himself. I still have that paper, over 6 years later, folded into his closet, to remember one of the first of many messy play days. Of course, as I full well knew, messy play isn’t always so readily embraced and explore. For some children, messy play will send them running for the hills or throwing a tantrum on the floor… which was the case with my next two kids. So, let’s talk about why exactly messy play is so darn important for kids, and then I’ll share a boat load of messy play ideas to inspire you! 1. Development – Messy play encourages healthy development for any kid at any age because it allows children to experience, interpret, and explore different textures. Often ones they aren’t likely to come by otherwise. While participating in messy play kids learn about different properties, use their imagination to create, and even draw letters or shapes with the tip of their finger. 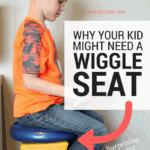 And, when the tactile sense is stimulated it’s not only good for their overall sensory processing, it will aide in their ability to touch any object and know what it is, without having to look (aka tactile discrimination), which is more important than you may think. Ultimately, messy play can even help with handwriting skills. This is also why I strongly advocate that even even babies be encouraged to get messy from their first days of eating. Check out more of the benefits in Why Babies Should Get Messy Eating. 2. Tactile Defensiveness – When kids don’t like to get messy or touch different texutres they may be tactile defensive, and messy play activities are the best thing to help them overcome it. Tactile defensiveness can have an impact on eating, fine-motor skills, and even a child’s ability to wear certain types of clothing. A child should NEVER be forced to participate in messy play, but that doesn’t mean they should be given a pass either. Slow, consistent, and patient encouragement are worth the effort, as well as modifying the activity for them, at least initially as they become more comfortable with the texture. Read more about tactile defensiveness. Including messy play as a sensory diet activity can help some children calm down or focus. (Get a free sensory diet template). Now it’s time for some messy play inspiration! I’ve listed over 47 messy play ideas for you below, many are perfect for toddlers through older kids. Some are links to recipes, DIY’s, or inexpensive products I’ve used and like. And, maybe you’ll think a few of your own ideas, the skies the limit if you’re thinking outside of the box! Painting with condiments, sauces, pudding, sour cream, whipped cream, etc. Listen I’m type A, I get it, who wants to deal with the mess? But, we know how important it is for our kids. I have some tips to help keep the mess manageable and your sanity in tact! Whenever possible move messy play activities outside, even in the grass where it doesn’t matter if your kids make a mess. Use a messy play tray like this one to keep the mess contained and easily able to clean up! 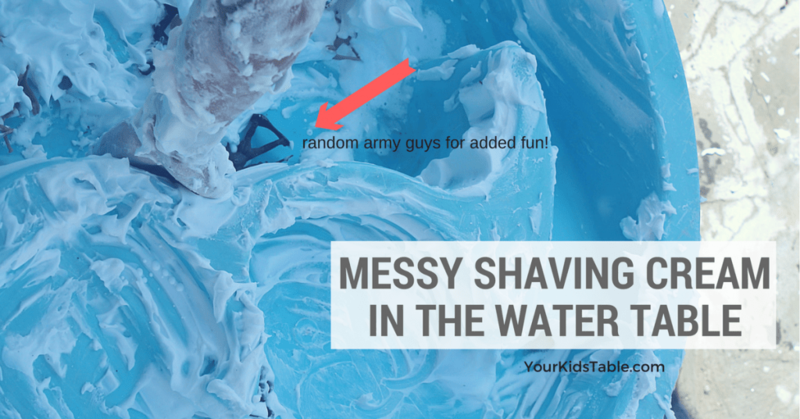 Put messy play in a dry bathtub and simply wash the mess down the drain and clean up your kiddo all at the same time. Use smocks or old shirts on your kids. 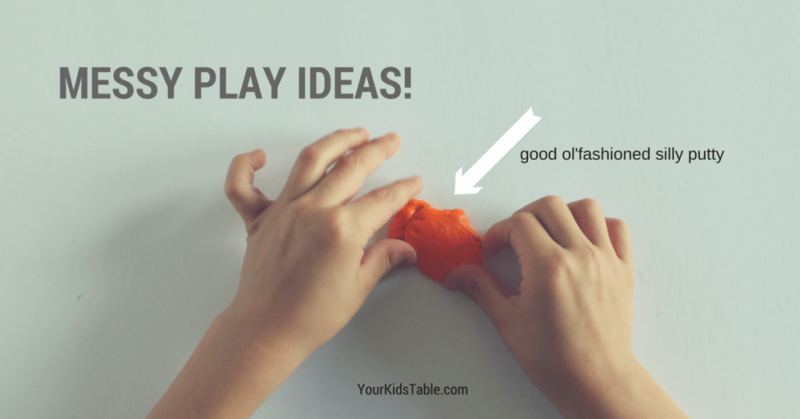 I often use a vinyl tablecloth and wipe it down or shake it off after we’re done with our messy play. Confine textures to a bin, aka a “sensory bin”. Check out my huge list of sensory bin ideas. Take advantage of that water table and fill it with your messy play, ours has had shaving cream in it more than water I think! One more way to confine the mess is a baby pool! Just put the messy play in a dry pool with your kiddos. Need Help with Messy Play? If your child is extremely intolerant to messy play, you may need some professional help for their sensory processing. A lot of kids do and that doesn’t necessarily mean your child has a diagnosis. Head over to sensory integration therapy to learn more. 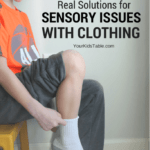 And, if you’re looking for more sensory activities and how to use them to benefit your child, check out the free workshop: How to Create a Sensory Diet in 4 Simple Steps. Hover over any picture or click on it for the pin it button to appear! Thank You, Thank You! Your web page is so helpful and full of ideas! Thanks so much! I’m glad you found it helpful. Came across your site on Pintrest. WOW I’m blown away, so much information that I can use as a T.A. I’m so glad you found your way here! !